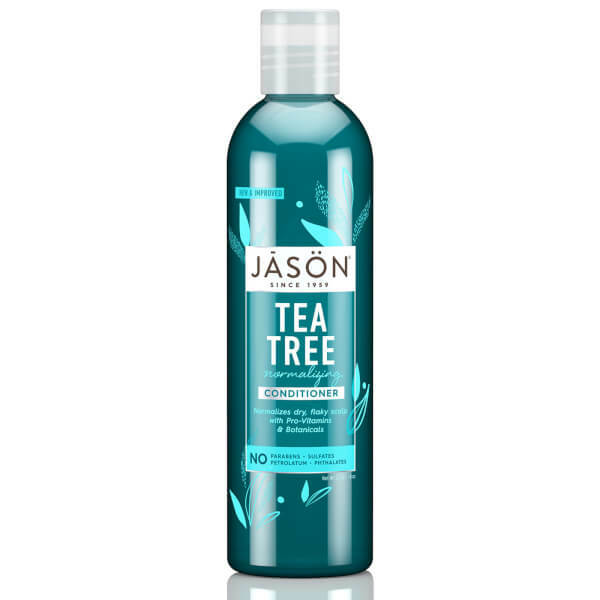 Designed to revitalise dry, brittle hair and smooth flaky irritated scalps, JASON Tea Tree Scalp Normalising Conditioner features aloe vera gel and sea algae extract to hydrate and plump up the hair fibre to protect against heat styling. Composed of Australian tea tree oil, known for its anti-bacterial and anti-fungicidal properties, JASON Tea Tree Scalp Normalising Conditioner controls itchiness whilst jojoba oil lubricates scalp and hair. Your hair will be left feeling light and shiny. For damaged hair allow to remain on for up to 15 minutes. For best results use in conjunction with JASON Tea Tree Scalp Normalising Shampoo.